If you’re looking to add a little landscaping to your barn area, why not use something that could also be helpful to your horses or other livestock as well as you! Herbs are a great way to add natural and organic landscaping to your barn, plus they are easy to care for and have a ton of practical uses! Peppermint and spearmint are great for the digestive system. It’s great for horses that are prone to colic and can help them relieve gas. Mint is easy to grow and has a somewhat viney appearance, plus it’s great to have around for cooking. This herb is an anti-inflammatory and analgesic. It’s great for helping with aches or pains. You can also use it as a sedative or relaxant. Take some to make a hot tea with after a hard day of mucking stalls and you’ll be asleep in no time! Fennel is another herb that can help with upset stomachs. But, it’s also great for milk production, so feeding it to broodmares will help in the first days of foaling. Fresh fennel can also be used in poultices for drawing out toxins and calming allergic skin reactions. While most people see the dandelion as a weed, it has a ton of medicinal properties as well. Dandelions are a natural source of Vitamin H, which is also known as Biotin. Feed it to horses are prone to hoof issues and possibly replace the cost of a supplement! Dandelion can also be used in poultices and compresses to draw out infections. It is also rich in potassium, magnesium and calcium. Garlic isn’t really an herb, but it is great for repelling flies. Be careful, however, not to mix garlic with some drugs, such as Bute, as it may have an interaction. This is great for mares that have strong cycles that make them moody. It can also be used to help broodmares keep their uterine muscles strong and aids in an easy labor. Many trainers use raspberry leaves to keep their show mare’s attitudes more consistent. Plus, it’s great for joint health! 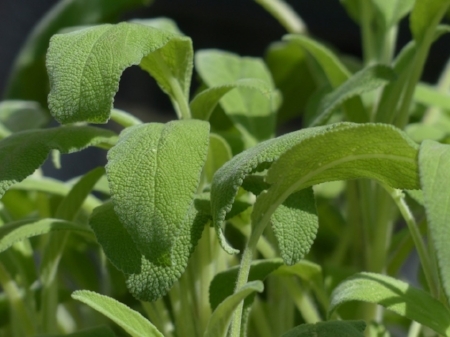 Sage is another herb that can help upset stomachs. It also helps reduce bloating. It does reduce milk flow for nursing mares, which means it can be helpful during weaning, but not when you need milk flow. It can also be used to reduce fever and to help with skin infections and fungus. Thyme helps break up congestion and relaxes the respiratory tract. It is great for allergy season when some horses seem to cough and have runny noses. These are just a few of the herbs that you can use around the barn and in the kitchen too! Newer PostHow Much Land Do You Need for Horses?